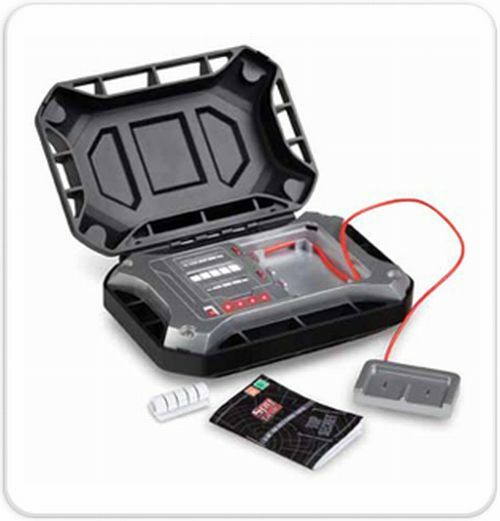 A lie detector kit is a central feature of any law enforcement agency. Lie detectors have been used, successfully, to nab suspects who are looking to hide the truth. There is something about taking a lie detection test that makes people nervous, and more often than not, their lie is caught.If you like to role-play as an undercover spy or as a law enforcement agent (such as a FBI or CIA agent), then you would need a lie detector kit to add credo to your imagined role. Spy Gear has launched a Lie Detector Kit toy that should be perfect for your role-play. With Spy Gear’s Lie Detector Kit, no one would be able to lie to you. Inspired by kits used in real life situations, the Lie Detector Kit toy looks like the real deal. The kit has a rectangular, black frame with a molded steel casing. Inside, the kit is made up of a grey panel that contains the lie indicator and finger pad. The finger pad is attached to the lie indicator with an orange wire. In order it find out if your suspect is lying they need to place their index and middle fingers on the finger pad. Begin with your round of questions, and if the suspect is lying the lie indicator will light up. The lie indicator is made of four orange colored LEDs. If three to four LEDs blink, the suspect is lying. Spy Gear’s Lie Detector Kit uses the moisture content on the skin to detect if a person is lying or not. If anyone is not being straightforward, the moisture content on their fingertips would increase and this is detected by the kit. This method is modeled on the galvanic skin response system, which is used in real life polygraph tests. Any lie detector kit is not foolproof; a good liar can easily beat the tests. Keeping this in mind, Spy Gear has included a handy lie detection booklet with the kit. The booklet has valuable tips on how to spot lies by reading the body language of the suspect. For instance, if the suspect shifts their gaze or moves their body away from you, it is a psychological indicator that the person is lying. The Lie Detector Kit from Spy Gear is the ultimate spy accessory to have for your role-play games. It can be used by anyone above the age of six. Now one can buy this kit at the price of $24.95 only. Should you think this is great, I am sure you will be jump in with both feet to get a Electronic Spy Camera Shirt and Spy Cam Car Key.